R Fulton Improvements has been in the HVAC business over 20 years, servicing residential and commercial clients throughout the area. Our licensed HVAC technicians are certified to work with both gas and oil systems. From minor repairs to whole heating system repairs and installation, call (678) 251-9181 for knowledgeable service and expert repair. Our service vans are equipped with all major brand heating system parts and supplies. R Fulton Improvements also offers emergency heating repairs. Call (678) 251-9181 24/7. When your heating system fails, you want a reliable HVAC contractor to get your heating system up and running again. 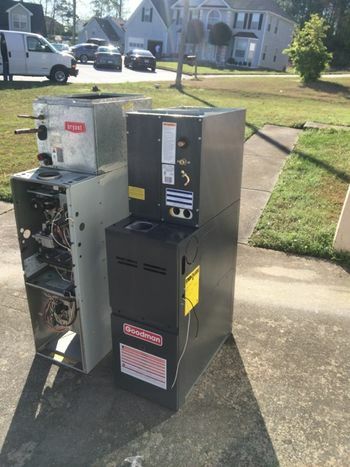 R Fulton Improvements has been in the heating repair business for more than 20 years. Call (678) 251-9181 for prompt, quality heating repair service. No one likes to take cold showers. When your hot water system fails, call R Fulton Improvements for expert repair. Whether it's a plumbing problem or a hot water heater problem, our certified contractors will get on site quickly to identify the source of the problem. R Fulton Improvements technicians are licensed to perform valve repairs, part replacement, and plumbing work for all major brand systems. Call (678) 251-9181 for emergency hot water repair service.